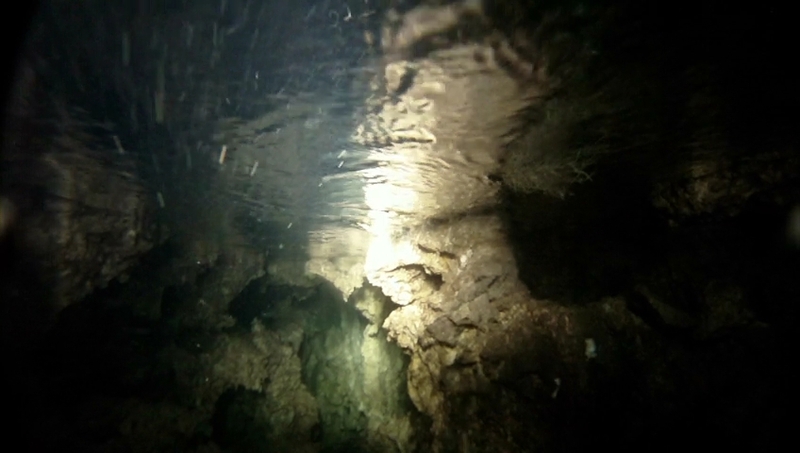 At the onset of summer 2013, website designer and videographer JM Libarnes, accompanied by Siargao’s tourism officer Donna Tiu, visited a little known spring in Siargao. Libarnes published a video of the spring on YouTube , and from then on, curious visitors started to make a detour on their way to Siargao and take a glimpse of this new attraction. 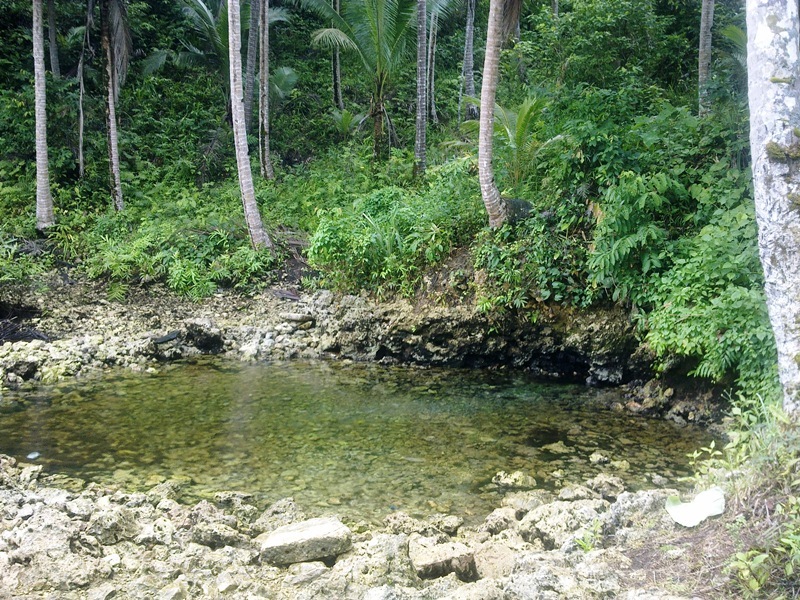 The spring is located 500 meters southwest of Barangay Katipunan, Pilar municipality, on the island of Siargao, Surigao del Norte, Philippines (9°49’41.99″N, 126° 5’24.15″E). 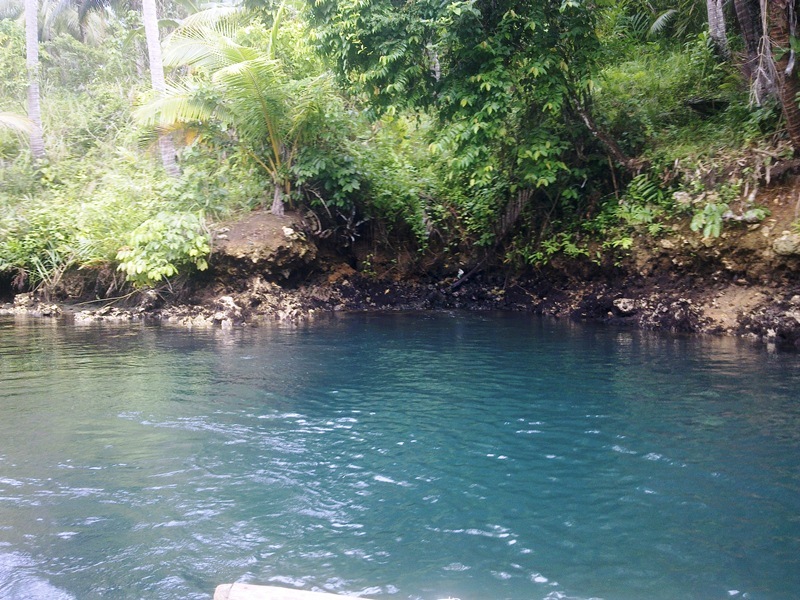 It feeds a small river that meanders for 4.5 kilometers along embankments of Nipa and mangrove trees, finally flushing out to sea at the eastern part of Siargao Island. 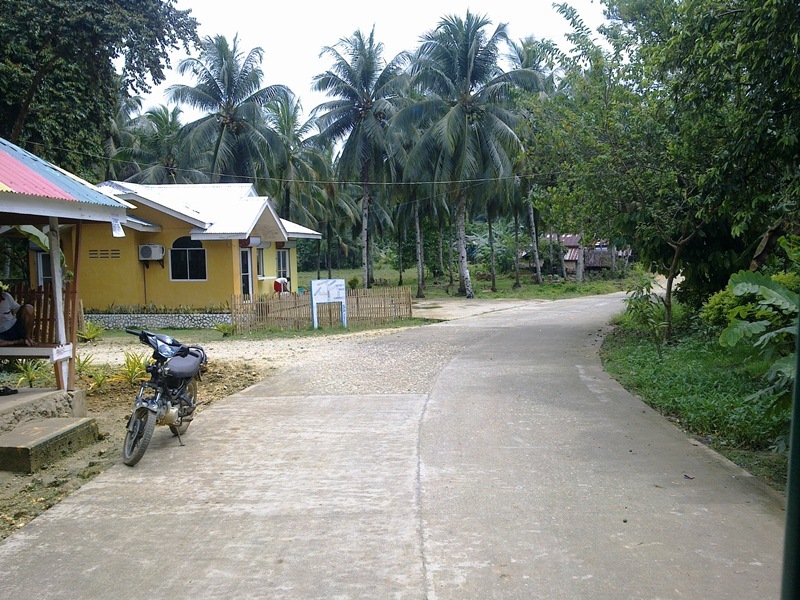 The barangay (population 600+), is accessible through the Corazon junction in the middle of the Dapa-General Luna road. 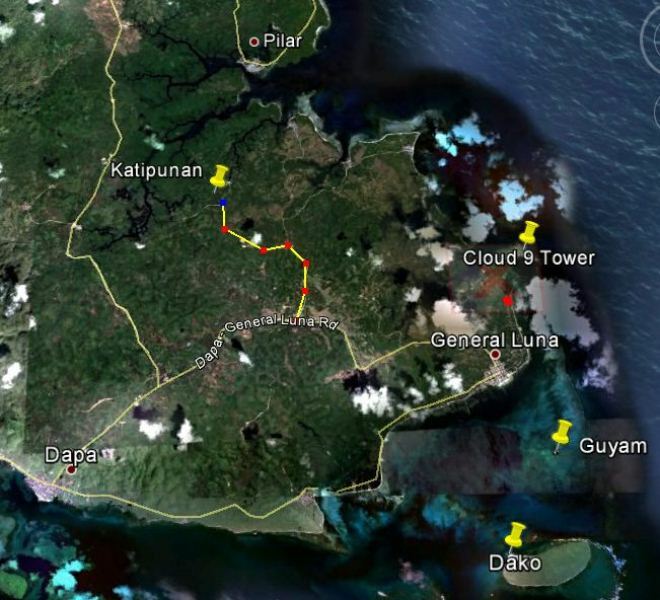 The junction is 8 kilometers from Dapa, and only 7 kilometers from General Luna. 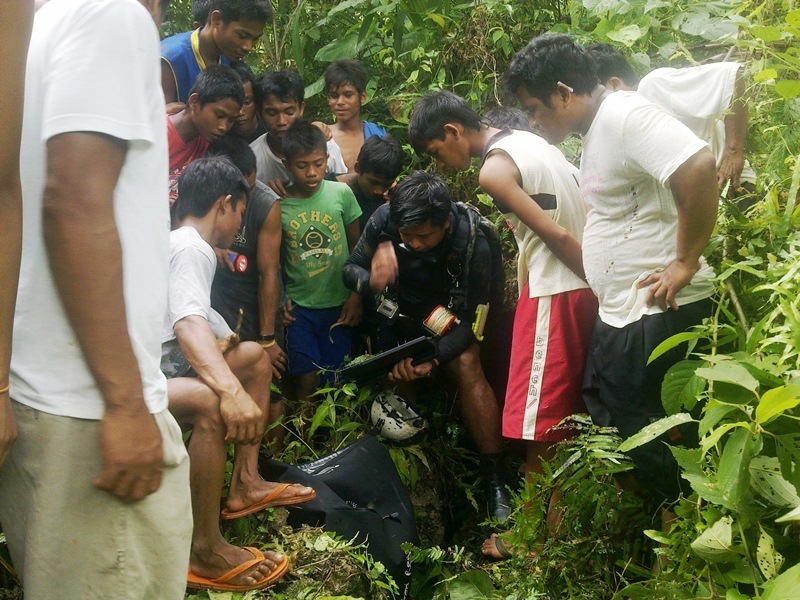 Soon after seeing the YouTube video, cave diver and FCD member Jake Miranda (Punta Bilar Dive Center-Surigao City) contacted local authorities of his intention to visit the spring in the hope of finding and exploring the underground source of the spring. Miranda had earlier sought the assistance of Dir. 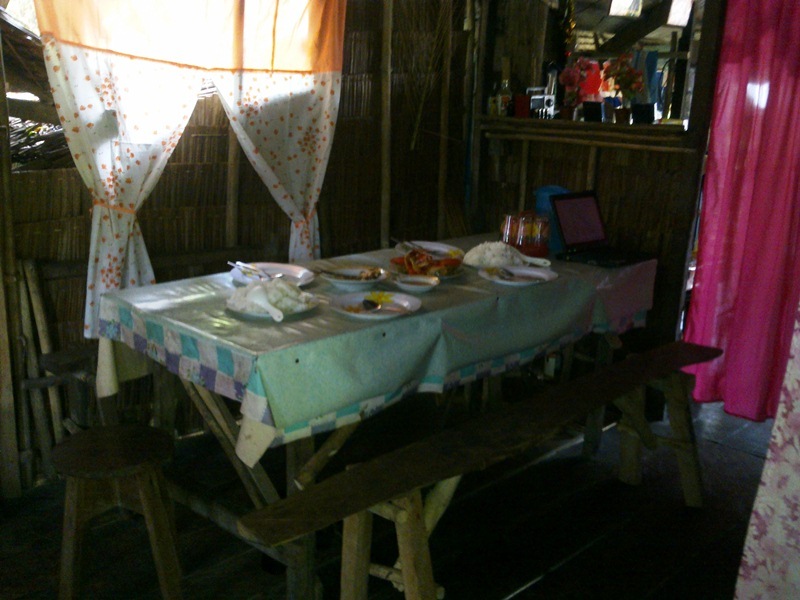 Mundita Lim of DENR-PAWB to send representatives from the DENR-PAWB Caraga to assess the area. 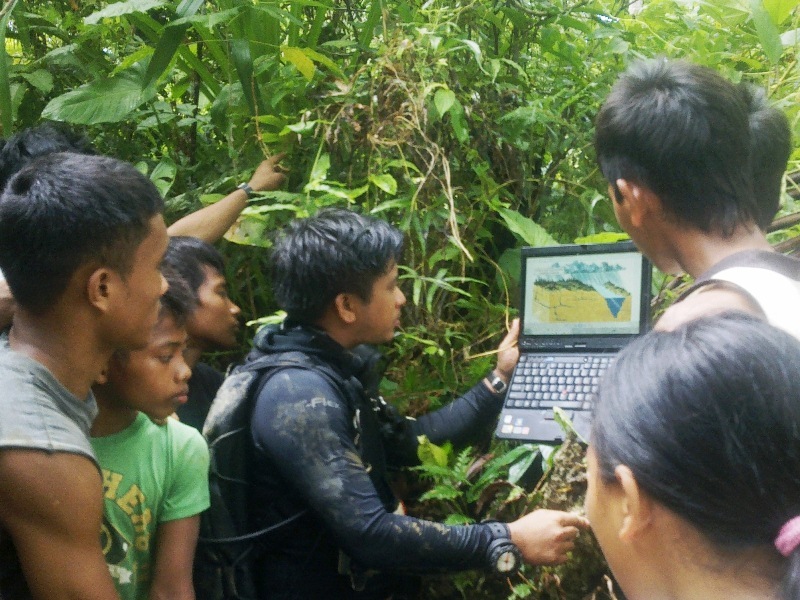 After the DENR assessment, permission was finally granted by no less than the governor of the province, Gov. Sol Matugas, who had earlier visited the site and gave specific instructions that no “dives” should be done in the area. 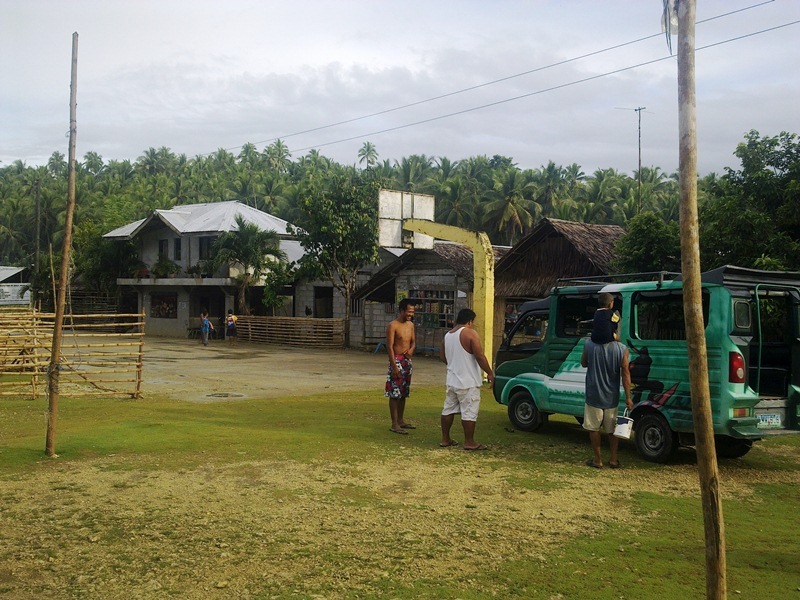 On the morning of June 6, 2013, Miranda, with the support of Barangay Chairperson Flora Forcadilla, and aided by local volunteers, made shallow dives in the area. 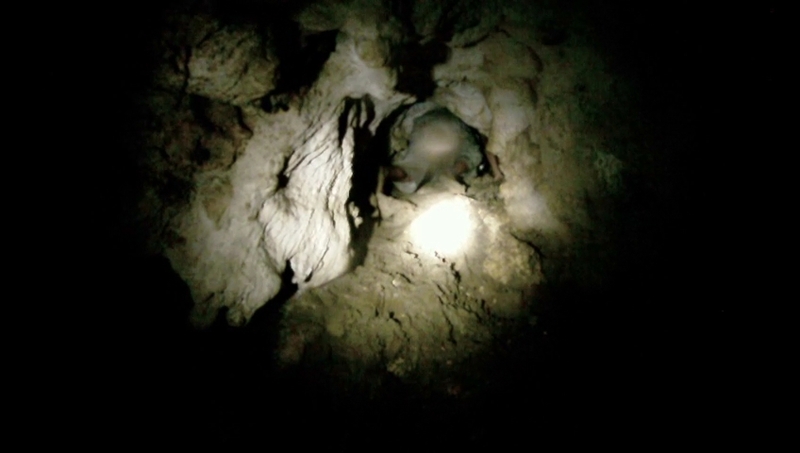 The team explored two small dry caves as well. After an exhaustive search, no “accessible” underwater entrance leading to an underground cave was found. Locals listening to how caves are formed. According to sources in the internet: “The soil type in Siargao Island is 80% Bolinao clay, 10% Bolinao clay steep phase, and 5% Jamoyaon clay loam.” In the Katipunan area, underneath this loamy soil, is more of the limestone substrate acting as the underground canal for rainwater. 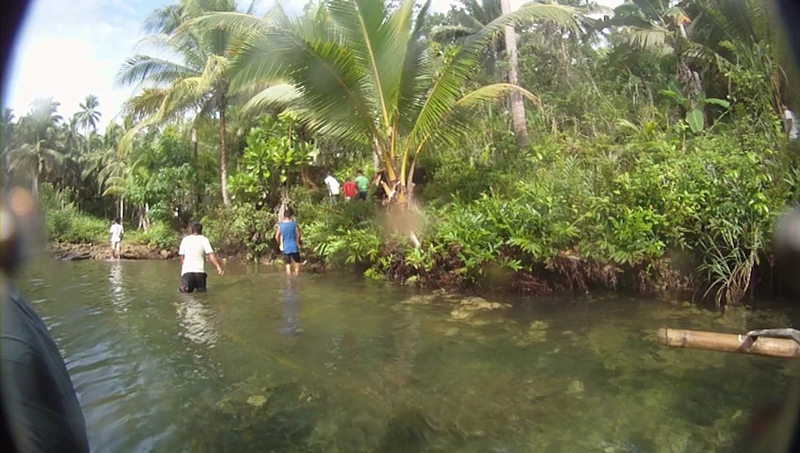 The rolling topography of the island, low altitude of the ridges southwest of the spring, and the presence of other “springs” nearby, may account for the weaker flow of water in the Katipunan spring. It is but one of the many outlets of water in the area. 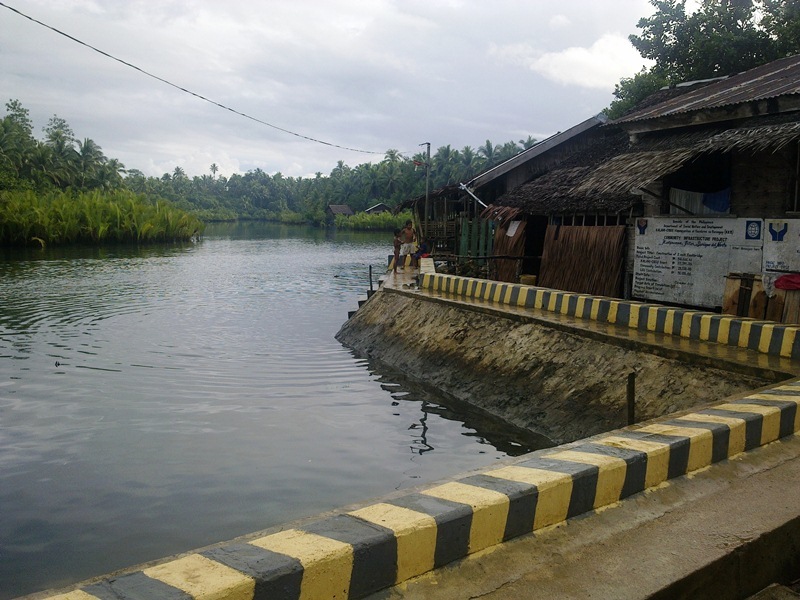 The longest river in Pilar municipality is actually the one that sources from Barangay Maasin-this river has a total distance of 8.5 kilometers. Such river systems have tourism potential as a river cruise attraction. Still one cannot discount the possibility of finding a large dry or wet cave system in the area. There are two springs in the river. The first spring one sees as you head upriver has a muddy bottom profile, thus swimmers have to contend with water turning murky at the slight disturbance. The furthermost spring, the “headspring,” this one with rocky limestone bottom, is the one that can be turned into a “natural” swimming pool. Shallow spring can be made deeper. Guide shows stones that should be removed. This spring, which flows from the side of a rocky outcrop, had an observed average water flow of 30 liters per second. Because of the shallow “catchment” pool, the water quickly cascades to the river. During low tide, when the river drains all its water to the sea, the pool is only knee deep at its deepest. The water during low tide is fresh and clear. During high tide, when sea water flows into the river, the pool fills up and water level rises by at least 4 feet, making the pool deep enough for swimming. During high tide, the water in the pool turns salty but remains clear. 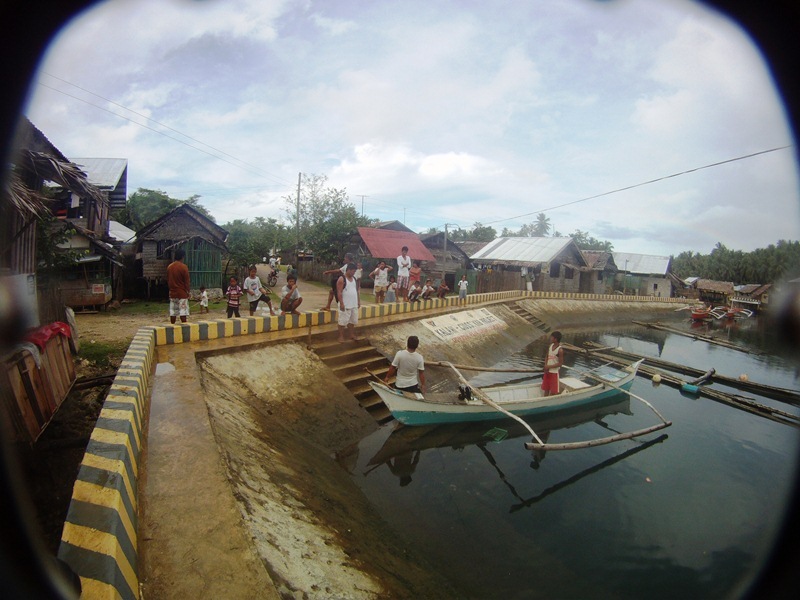 The local barangay can turn this main spring into two pools-one shallow pool for children, and a deeper pool for adults. But they must first remove the stones left by crab fishermen who put them there. 1. First, an initial meeting for the creation master plan involving the council and the tourism office must take place. The components of the master plan will be the objective, work design, tourism fees, economic activity, marketing and sustainability. a. Objective-To bring in local and foreign tourists to the spring pool. b. Work Design-To effectively and efficiently use available manpower, funding and other resources to meet the objective. c. Tourism Fees-To design affordable tourism fees to attract tourists to the area. d. Economic Activity-To collect fees, encourage economic enterprise such as food catering, river cruise, boat ferrying and tourist guiding. 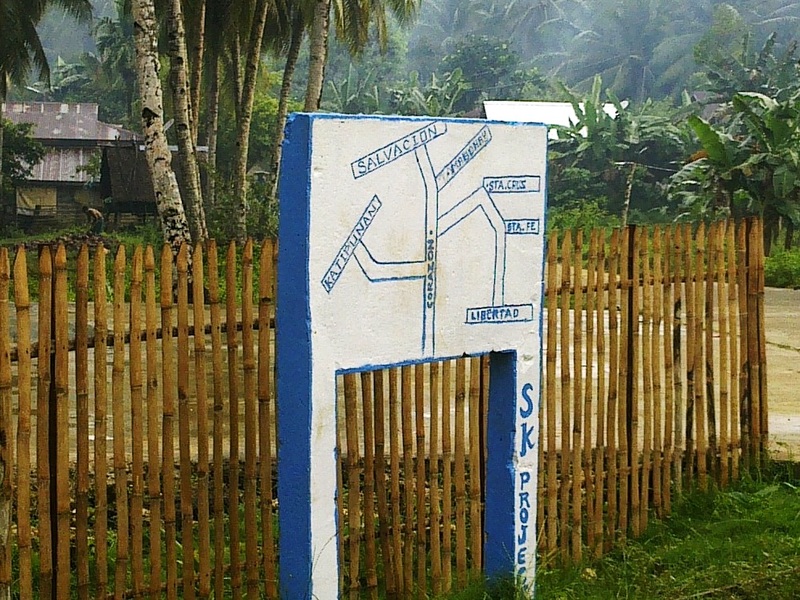 e. Marketing-To place directional and informative signs from Dapa and General Luna leading to Barangay Katipunan. f. Sustainability-To train the local populace in embracing and protecting this natural resource. 2. Second, a work schedule should be finalized to remove the stones, erect cottages, build or redesign boat ferries, and place road signs leading to the area. 3. 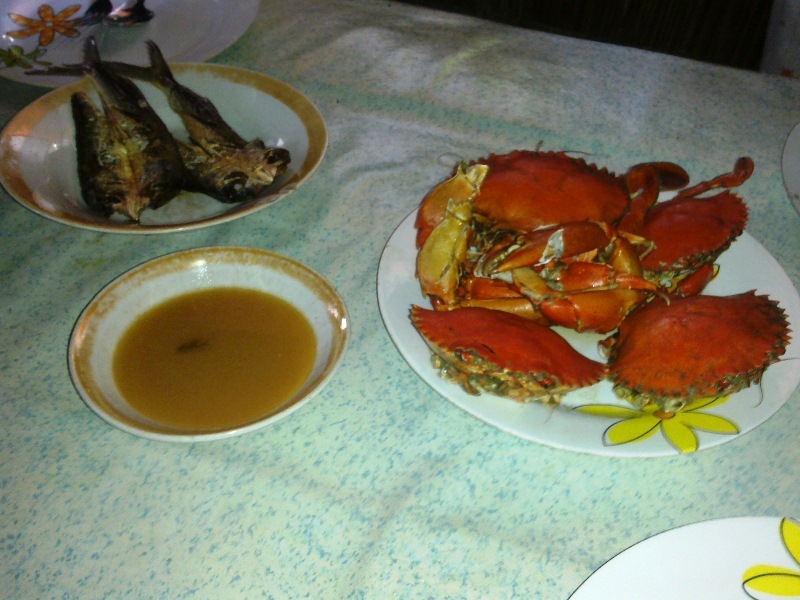 There are also food products that can be marketed by Barangay Katipunan. 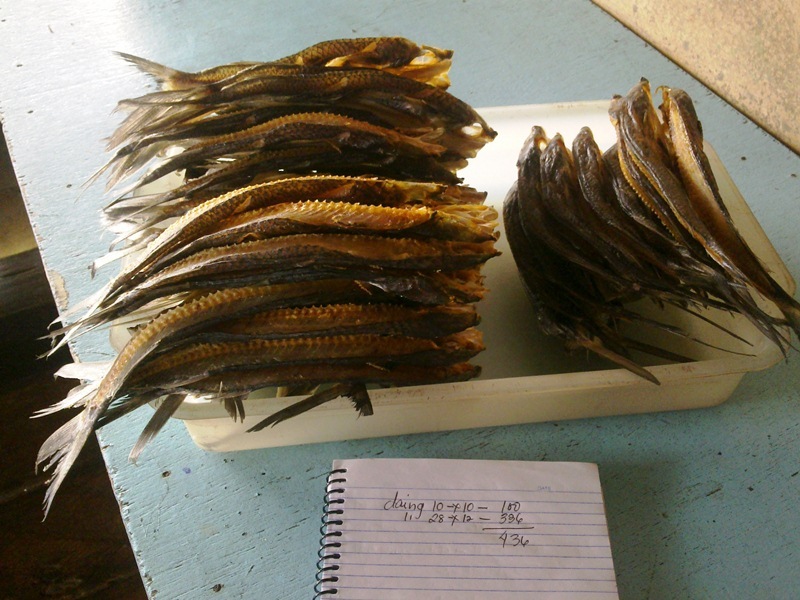 Locals can sell and cook on site the popular dried flying fish called “Bang-si” and mud crabs which are aplenty in the area.